In Enrique Tomás we invite you to enjoy one of the jewels of our gastronomy, the Iberico Bellota Ham, a unique product that can only be made in the Iberian Peninsula, ideal for jamón lovers who want to taste a dry cured ham full of nuances. 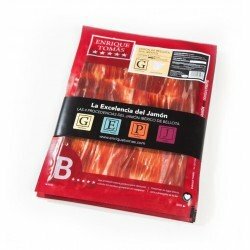 You can choose our Jamón Ibérico de Bellota within a diverse range made up of our Selection product as well as pieces from four different origins: Salamanca (Guijuelo) with a soft and pleasant taste to the palate, Huelva (Jabugo), characterized by its strong and long-lasting taste, Cáceres-Badajoz (Extremadura), full of aromas with an explosive taste and Córdoba (Valle de los pedroches), which is stronger. 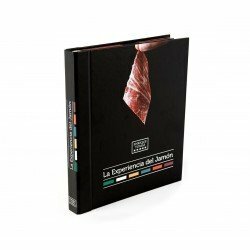 Whether you choose any of these: whole or boneless piece, sliced Jamón by knife or by slicer or in ready-to-eat packs which are ideal for those who do not want to cut at home, Enrique Tomás guarantees that you will enjoy a unique product of the highest quality. Made with the hind leg of pigs 50% or 75% of Iberian breed, our Iberico Bellota Ham is an ideal product for maximum enjoyment of the senses. Available only in the Iberian Peninsula, pigs of this breed are fed with fodder until they reach the first 100 kilos, then they are taken to the pastureland “Dehesa” to carry out the final stage of fattening by eating acorns, grasses and wild plants for 4 months. This breeding along with the genetic particularities of the animal, results in a Jamón whose unique flavour is the result of the fat infiltrated into the muscle giving this marbling effect, juicy taste and with an oily touch that is exquisite to the palate. There is no doubt that the Iberian pig provides the best dry cured meat in the world, and Enrique Tomás' Iberico Bellota Ham is no exception. We select the best Iberian specimens with a pure breed of 50% or 75% to ensure an excellent product, which, thanks to the different sources in which it has been cooked brings a taste of its own to each variety. Made mainly in Gijuelo with a pleasant taste on the palate. Also known as Jamón de Jabugo for the area where they are made, has a strong taste that lasts long in the palate. They are the emblem of the region of Extremadura, with aromatic nuances whose taste explodes in the mouth. Also known as Pedroches because it is cooked in the Valle of Pedroches, it is intense and tasty. Each expert brings the nuances of the area where he comes from and, after 36 months of dry-curing, we obtain a product with an exceptional flavour: our J Iberico de Bellota Ham.